The legend of a monkey who was hanged as a French spy is brought to life through clever puppetry in a timely tale exploring xenophobia. 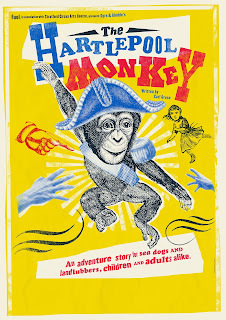 Based on the 200-year-old legend, The Hartlepool Monkey tells the story of a ship wrecked off the Hartlepool coast with just two survivors: the cabin girl and the ship’s mascot, a chimpanzee in military uniform. Terrified of French invasion and unfamiliar with what a Frenchman should look like, the locals put the monkey on trial as a spy with grisly consequence. 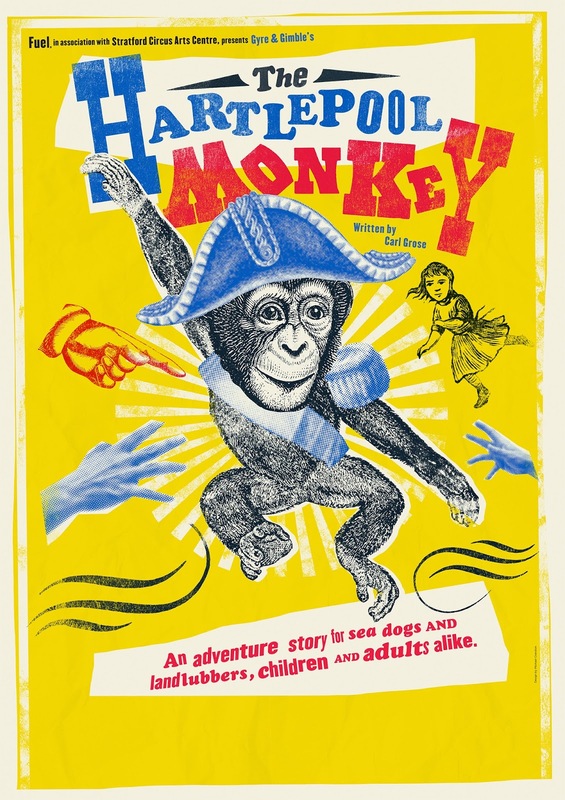 At a time when Britain is examining its own tolerance and acceptance of newcomers, The Hartlepool Monkey is a timely production about the irrationality of xenophobia whilst celebrating humanity’s ability to overcome prejudice. Gyre & Gimble was founded by Finn Caldwell and Toby Olié, who met on War Horse and went on to become associate puppetry directors of the show. 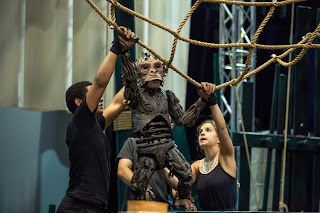 They place puppetry at the heart of storytelling, creating compelling characters to lead audiences through fantastical stories and expand expectations of what puppetry is capable of. 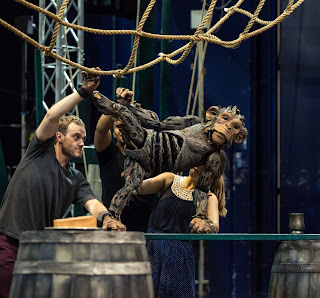 Following War Horse, they co-directed The Elephantom, which transferred to the West End, and have since created puppetry for Michael Morpurgo’s Running Wild, new musical The Grinning Man, and Dr Seuss’s The Loraxwhich returns to the Old Vic in October. Fuel aims to catalyse positive change in the world by producing new live performance by inspiring theatre makers for and with people across the UK and beyond. The company seeks to realise this vision by producing a programme of artistic work inspired by the ambition of the outstanding artists they support. These artists encourage audiences to understand fears, imagine a different future, and through that experience and insight, inspire change – individually and collectively – to better understand and more fully contribute to the world we live in. Fuel was founded in 2004 and is led by Kate McGrath. From a base at Somerset House, London, Fuel works locally, nationally and internationally to develop, create and distribute new work to the widest possible audience. Fuel is a National Portfolio Organisation of Arts Council England, and a registered charity. Fuel is currently working with artists including: Will Adamsdale, Clod Ensemble, Encounter, Inua Ellams, Lewis Gibson, Gyre & Gimble, Nick Makoha, Racheal Ofori, Frauke Requardt, David Rosenberg, Andy Smith, Melly Still, Uninvited Guests and Melanie Wilson. Stratford Circus Arts Centreprovides world-class, accessible creative experiences and performances on the doorstep of people in Newham and East London, driven by the belief that access to art brings joy, empowers people, and draws them together. Stratford Circus Arts Centre is a vibrant place to create and experience art through world-class theatre, dance, music and circus and visual exhibitions, with work for families and young people.Its extensive creative learning programme works with local schools and community organisations to introduce local people to artistic experiences through workshops and bespoke creative projects.A modern and versatile building, it receives more than 125,000 visits a year and is a key resource for the local community. Stratford Circus Arts Centre is a National Portfolio Organisation of Arts Council England and a registered charity.